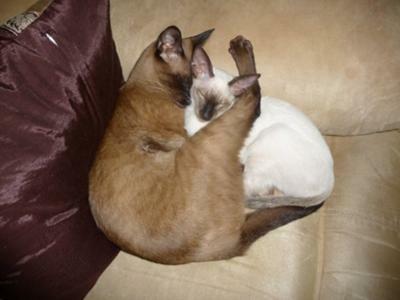 I have 3 cats, a seal point Siamese called Inca, a natural coloured Tonkinese and a tawny coloured Somali. Out of all of them Inca is the most intelligent, but her pee smells a lot in comparison to the others - like very strong ammonia, so strong it makes you feel dizzy if you're near the litter tray. I'd spoken to my vet, made sure she was healthy etc, and changed the 4 litter trays every day... however it still had that pungent ammonia smell so strong it's hard to breathe when I changed the litters. I was not sure what to do next in order to fix the problem and ready to just give up, when it seemed that lil Inca had a solution of her own. I walked into the bathroom one day and heard a gurgling sound like the tap was left on a little bit, and there was Inca, sitting in the bath, standing up with her front paws resting on the top, and she was looking down the plug hole making sure she was directly peeing in the hole. I just watched in amazement, and she looked at me with her big dark blue eyes and gave the cutest little meow as if to say "I can fix the problem". It's hilarious to watch, she wiggles her bum as she stands on two paws looking back until she knows she's aiming correctly. KikiBeak pees on my bed! I took this older male Siamese cat from the shelter about 8 years ago. He was either 5 or 7 years old at the time, depends on who you asked. Anyway, he's old now but still going strong. I've added cats along the way and he has become bitterly jealous of them. He "marks" me as his own by peeing on me when I'm sleeping! Or, I get in my bed and it's soaked with his urine. It's disgusting so I took to covering my bed with plastic. He just pulls it off and pees on the sheets. Or, I find puddles of pee and poo on the plastic. I have enough litter boxes, so it's not that, I know this is a jealousy thing. I hate to ban him from my bed because we snuggle and cuddle every night and I brush him for 15 minutes as a routine. But, the other cats try to elbow in and he gets mad, pouts and PEES. I'm at the end of my rope. By banning him from my room I have to kick all the cats out and it's too bad because they like being in there and they are blameless. Help! I would never get rid of him. Adoption is for LIFE, plain and simple. If you have new idea, please let me know. I've tried the pheromone sprays, extra litter boxes (even put one ON my bed, no use). Really, I've tried so much with no luck at all. He's a beautiful Seal and I love him to distraction. But this is killing me. Reply from Caroline: Molly I really do feel for you as this is such a difficult behavior to tackle and change, I even just wrote a newsletter about this type of problem, although it doesn't really answer your particular question. I have a friend with a male cat that does similar things (like pee on the bed and other furniture) and at night he's confined to the bathroom, where he has his own bed, litter trays, and food. I think you have to get a bit tough with this and shut him somewhere where he can be alone (and not do any damage) at night, otherwise this will continue. Make time to cuddle him alone for fifteen minutes before you go to bed, then shut him in. He'll get used to it. Ha ha! My 4 year old Siamese chocolate point pees in the bathroom sink all the time but it drives me nuts - constantly cleaning his 2 litter boxes and yet no success! He loves the sink for some reason and yes it does discolor the sink. But he's still my baby. Our Siamese cross does that too, but I must warn you that if you are not around to rinse out the tub, the pee will probably discolor the metal around the hole. Even the slightest residue will do it, so would advise that if you are away for any length of time you might want to close the door. As an aside, we had a Siamese who trained himself to use the toilet for Number Two. At first we noticed strange poos, so we started watching, and sure enough, he was pooping in there! No litter box mess anymore, but he never did learn to flush! Wow! That is amazing! And they are truly beautiful indeed! Great story, very clever cat! Katje, thank you! For the lovely photo of Chinky and Inca and your wonderful story. I wish you could send Inca over here to teach my cat Bandit how to do that. Most of the time he's very clean and the litter tray disguises most things, but just occasionally he gets spooked by something and pees where he shouldn't.